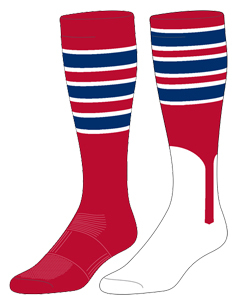 Below you will find the three styles of Custom Socks and Custom Stirrups we offer. Each style has up to eight available patterns and 43 available colors you can choose to customize with. For more information about available colors please see the section below. Click one of the options below to start your customization experience. Custom Socks and Custom Stirrups have become one of the most demanded products over the last couple years. Coaches are able to look through multiple designs and colors to create a truly unique look for their team. Our custom sock and custom stirrup builder is designed to provide you will everything you will need to design the coolest, most unique socks or stirrups possible. All of our custom stirrups and custom socks are manufactured right here in the USA and made from only the highest quality materials. We have designed our custom order system to be as smooth and simple as possible. This not only makes ordering your custom socks and custom stirrups easy, but also speeds up the order and delivery time. Turnaround time on all custom order stirrups is estimated to be 2 to 3 weeks and 10 business days for all custom socks. During peak season allow for 4-6 weeks on all custom stirrups (November 15th – April 30th). A great custom sock and custom stirrup builder isn't complete without a wide variety of colors to choose from. Our custom sock and stirrup builder offers 43 different colors for stirrups and 27 different colors for socks to choose from to mix and match in any way you see fit. 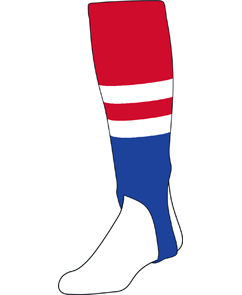 When you are picking out your custom sock or stirrup colors make sure to match the colors to the name of your team colors and not your computer monitor. All computer monitors vary in brightness and color so if your team color is scarlet choose scarlet, not the color that matches via your monitor.